All great projects begin the same way: by designing a t-shirt. So it was with Daring Fireball, which I started work on in 1979 as a six-year-old. I didn’t launch the web site for another 23 years, but that’s nothing compared to the original Carter administration-era shirt design, which didn’t make it into production until now. These fine shirts are part of Coudal Partner’s amazing Swap Meat (don’t forget to check out their TV commercial). This is a one-time run of only 75 shirts — 25 each in men’s M, L, and XL. 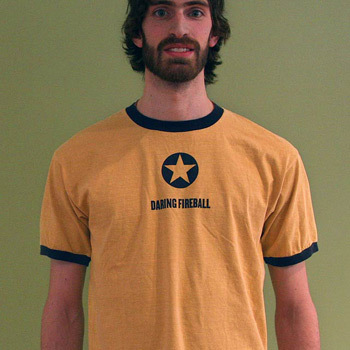 Orders are placed through and shipped from the Swap Meat store, but, as with all Daring Fireball t-shirts, each comes with a one-year membership to DF (or a one-year extension for existing members).